Wow! The Florida fighting conch (Strombus alatus) looks for all the world like a scary predator from an early Roger Corman horror movie or perhaps an alien invader from the 1960s, pre-special effects Outer Limits series. 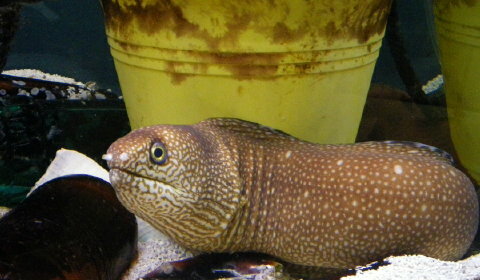 Note its bizarre sensory tentacles framing its proboscis. 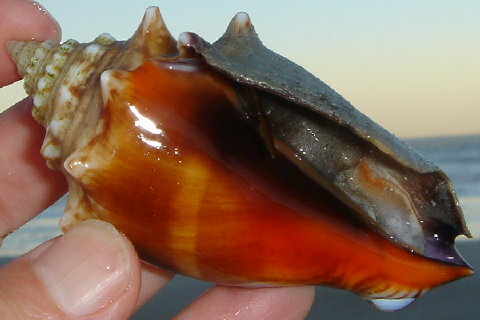 A small-to-medium sized conch, Strombus alatus measures three-to-four inches long with a beautiful blended color pattern of light tan to deep, almost reddish brown. 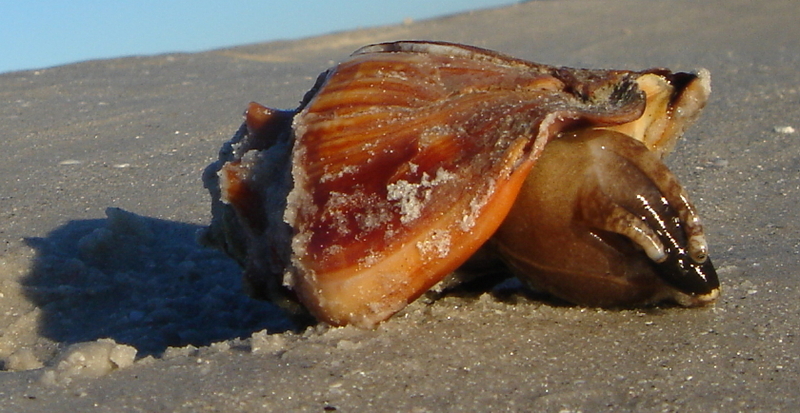 Conchs and whelks burrow into the sand of the surf zone and surface for foraging and other activities as the tide recedes. 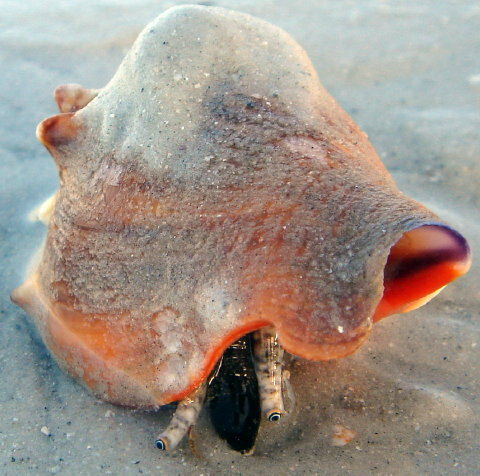 Turtle Journal’s Sue Wieber Nourse found this fighting conch on the falling morning tide. 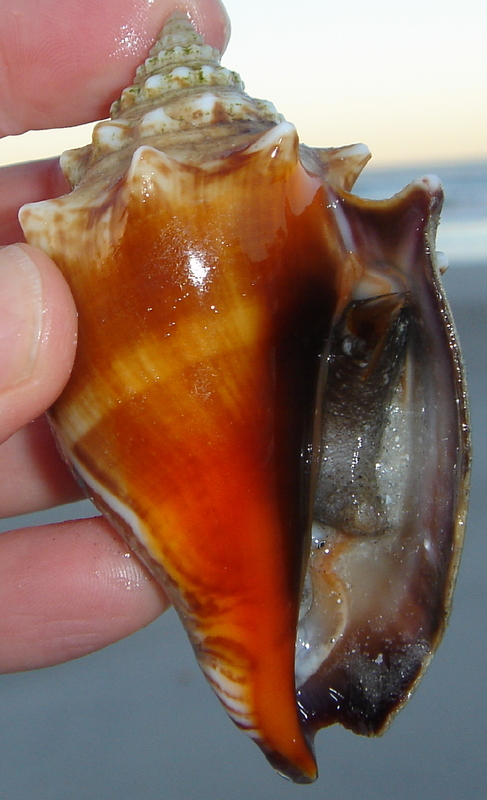 The spire at the top of the Florida fighting conch tends to be lighter colored with knobs along the ridges. A backside look at shell, spire and knobs. Fighting conchs earned their reputation with aggressive behavior in response to interference by human collectors and other annoying predators. 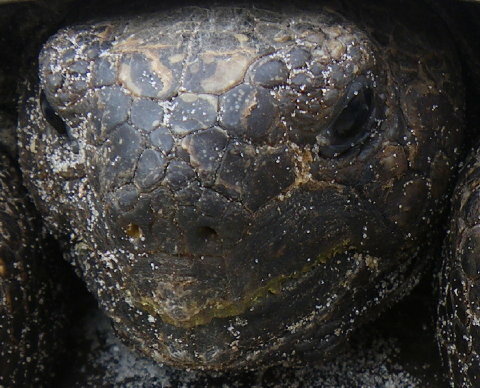 Luckily for Turtle Journal, Florida’s winter cold snap has mitigated this reputed fighting spirit. 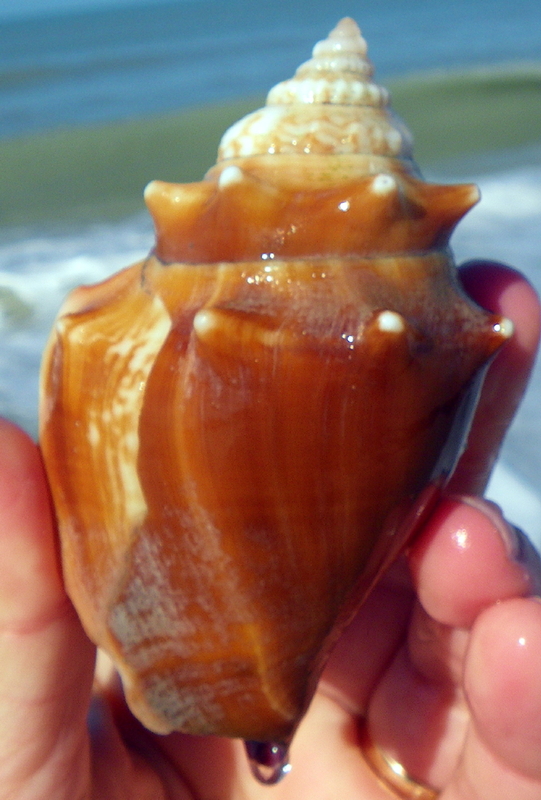 As the Turtle Journal team strolled Vanderbilt Beach this February, we encountered lots and lots of Florida fighting conchs rising from the beach sand as each tide receded. 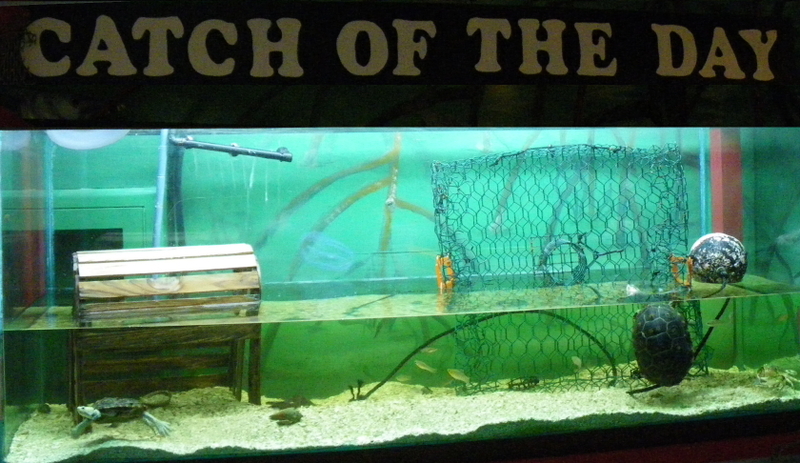 Perhaps ironic, pehaps not; the “Catch of the Day” tank in the Discovery Center of the Conservancy of Southwest Florida features diamondback terrapins. Inside the aquarium with three adult terrapins, a few crabs and some local fish is a large crab trap. You may be aware that vast numbers of diamondback terrapins have been and still are killed each year as by-catch in crab traps all along the Atlantic and Gulf coasts. 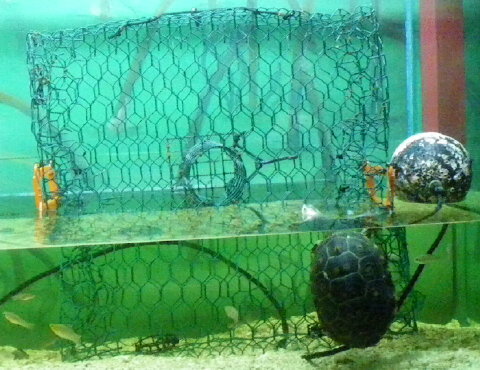 Hungry and curious turtles become attracted by the bait (and the captured crabs), enter the trap and cannot escape. Unlike crabs, terrapins are air breathers and are drowned by the thousands in residential, commercial and “ghost” traps from Massachusetts to Texas. 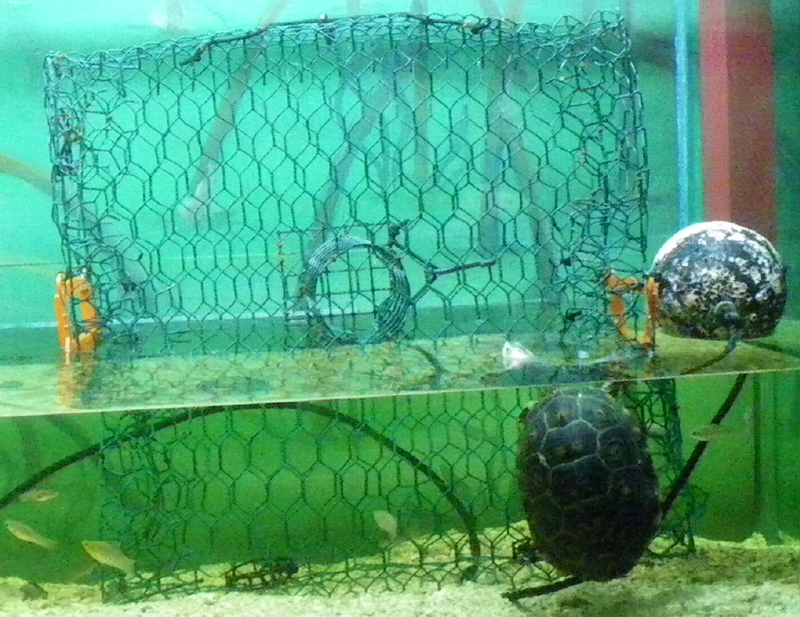 The crab trap shown in the Conservancy’s “Catch of the Day” tank is equipped with TEDs (turtle excluder devices) that prevent most terrapins from entering the trap, while allowing crabs to gain easy access. TEDs prove beneficial for harvesters since they keep aggressive and hungry turtles from eating the trap’s bait first and then consuming the captured crabs for dessert. The height of the TED opening excludes larger turtles with their thicker girth from gaining access, while allowing crabs to enter with no difficulty. Because terrapins exhibit significant gender dimorphism with females twice the length and four times the mass of males, TEDs preferentially protect mature, breeding females with their much thicker girth. 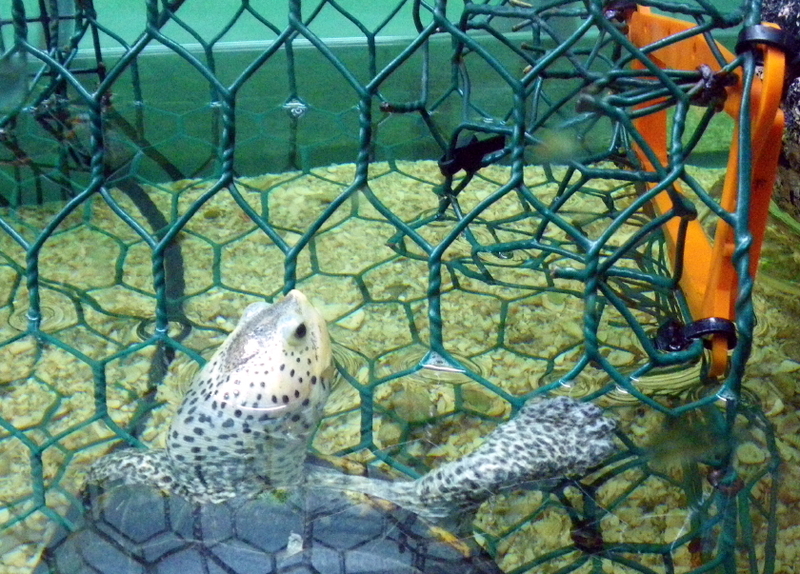 Males and juvenile turtles of both genders are more likely to become trapped and drown in crab traps. Use of traps without TEDs substantially alters the gender ratio within a population. You will have noted that the Conservancy keeps the water level below the TED-equipped entrances. Since this trap is not fully submerged as crab traps normally are, even in the unlikely case that a curious turtle climbed the walls and forced its entry, it would not drown. A perfect illustration of why crab harvesters benefit from excluding terrapins from their traps came by accident at the Conservancy while Turtle Journal’s Sue Wieber Nourse was shooting footage (see above). Someone placed a squid in the “Catch of the Day” tank for the crabs to feed on, but mistakenly put it within reach of the terrapins. While not their normal food at the Conservancy, the temptation of fresh calamari was too overwhelming for a terrapin to resist. Bon appetite! 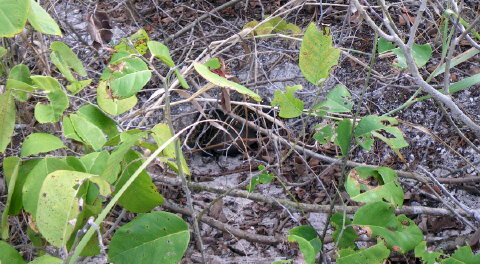 Winter 2010 has been a tough season for Florida reptiles and amphibians. The January cold snap drove thousands of Atlantic and Gulf Coast sea turtles onto the beach, cold-stunned and helpless. 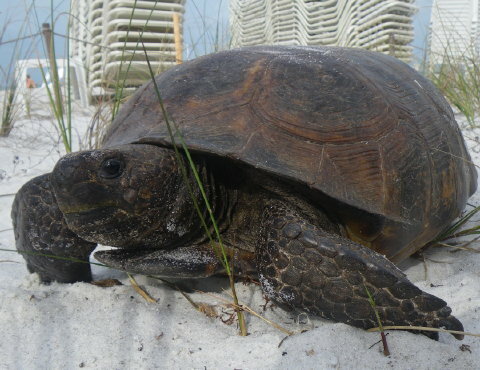 You may recall that the Turtle Journal team found a juvenile loggerhead sea turtle washed up with the high tide on Vanderbilt Beach on February 7th; see Turtle Journal Discovers Loggerhead Sea Turtle on Gulf Coast Beach. Anoles and other lizards were equally stunned by the January chill and fell from trees like balls of hail onto the nature trails of Southwest Florida. Unsurprisingly, gopher tortoises remained largely invisible during the Turtle Journal expedition to the Gulf Coast of Southwest Florida. Buried deep into their burrows, dug into some of the priciest turtle property in the world, they didn’t even venture out on the few occasions that temperatures nosed into the low 70s. Nighttimes in the 40s were sufficient to convince any correct thinking gopher tortoise to choose a comfortable snooze over a wind-swept promenade. Yet, there’s always one critter that doesn’t get the word … or thinks that the rules of cold-blooded life simply don’t apply to him. After all, he’s the top banana, living life large in the shadow of the five-star Ritz Carlton Resort Hotel on Vanderbilt Beach. Sue Wieber Nourse surprised this male tortoise as he stiff-leggedly strolled from his protected borrow, across the dunes, down to the beach and then back again on a sunny afternoon. 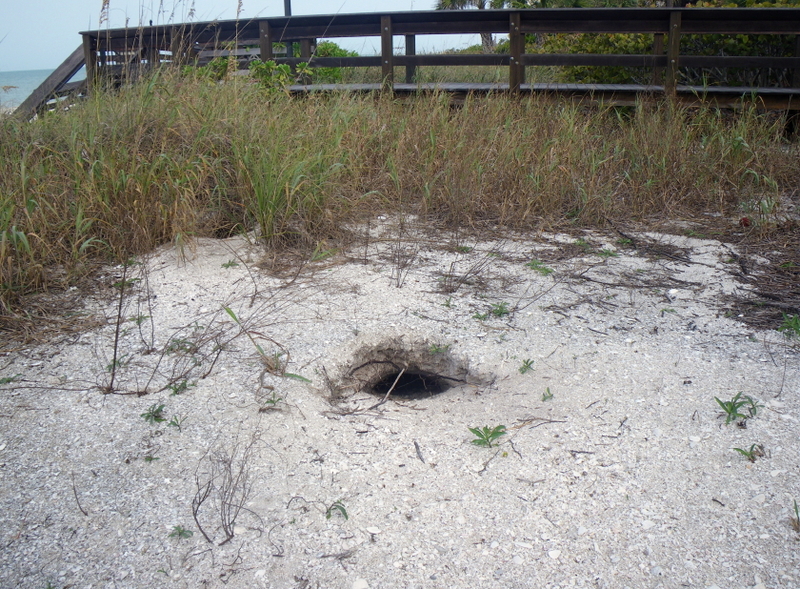 Not a tourist nor another gopher tortoise in sight. Even without a high tech field kit, a well prepared researcher is always prepared to do a little science. 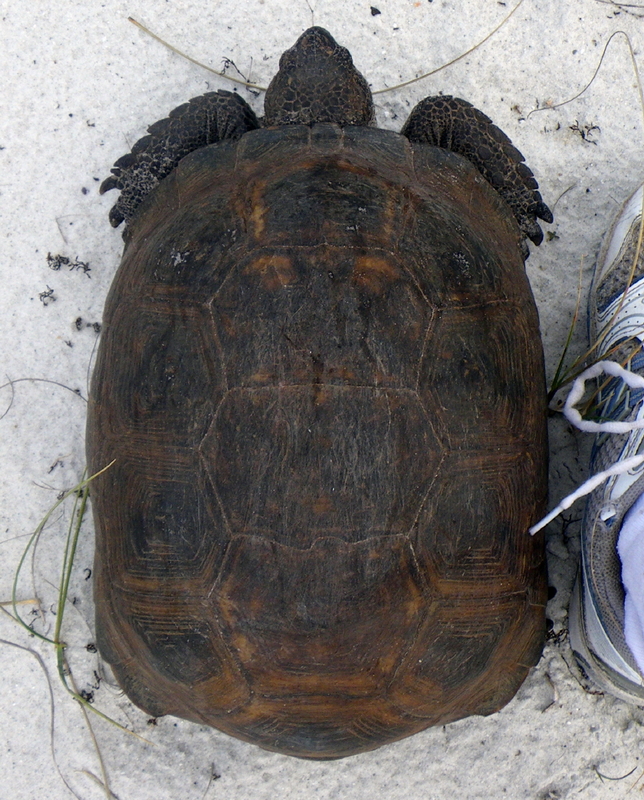 Sue gets her sneaker next to the gopher tortoise to obtain an ~ 12 inch straight-line carapace length. 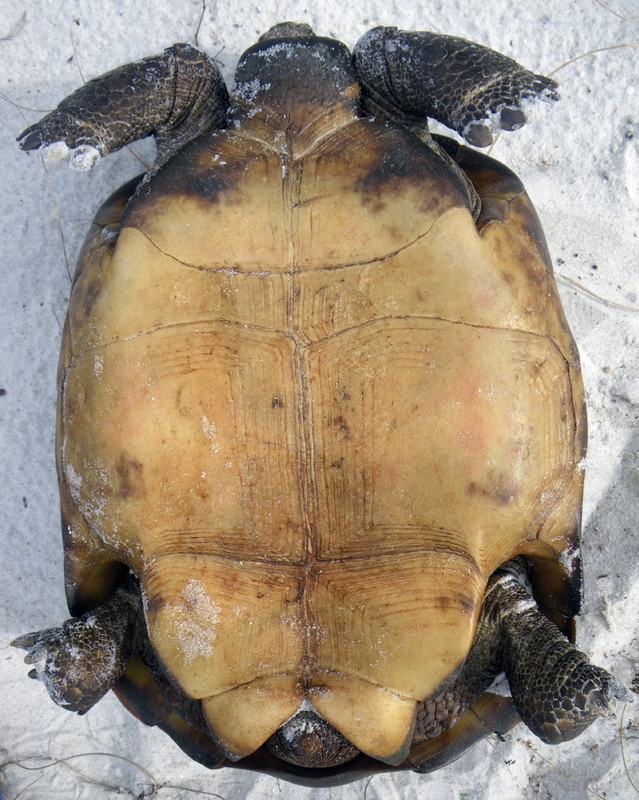 The plastron shows the male concavity in the rear and annual growth lines on each scute. Having surveyed his empire and established his rightful position as alpha male on the Ritz Carlton beach, the gopher tortoise slid back into his well camouflaged and protected burrow, hanging out at the entrance … in case some equally adventuresome female tortoise had caught a glimpse of his demonstrable pre-eminence. 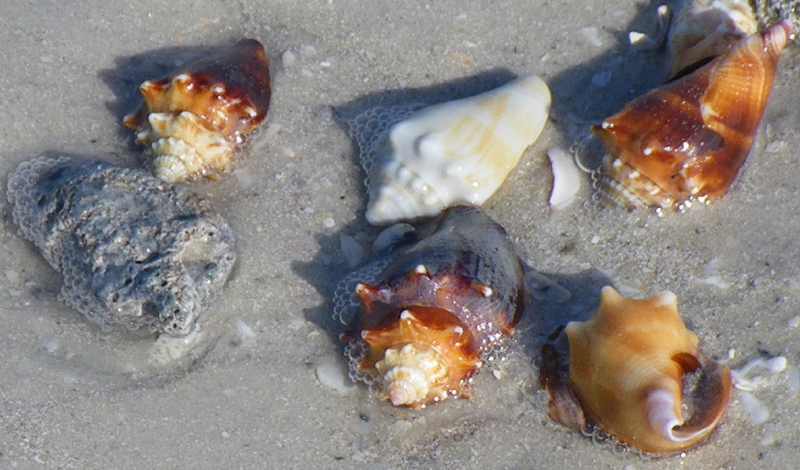 Hope springs eternal … even in the winter chill of Southwest Florida. 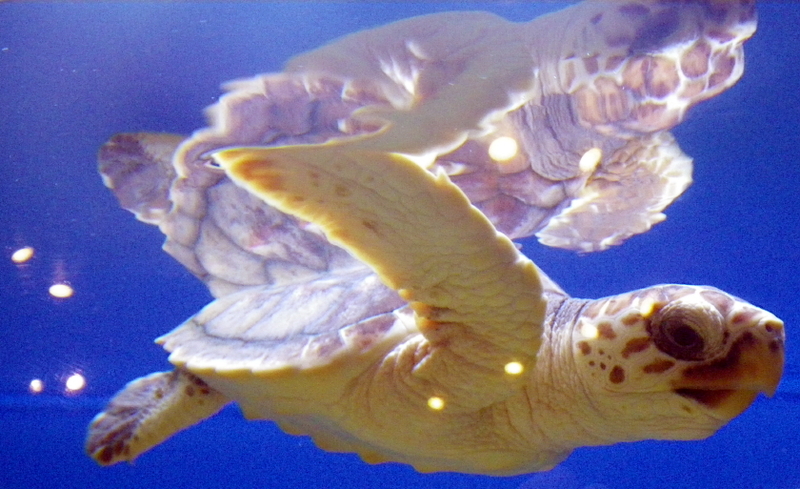 A small juvenile loggerhead sea turtle wows visitors to the Conservancy of Southwest Florida in Naples. This young female was part of a temperature-gender experiment and will be released back into the wild once she attains 18 inches carapace length. Now she’s enjoying the hospitality of the Conservancy and chowing down to reach her release size as soon as possible. The Turtle Journal team had the fortune to tour the Conservancy during feeding time for this precious critter, and Sue Wieber Nourse captured the moment in the video clip above. When the Turtle Journal team visited the Conservancy of Southwest Florida last week, Sue Wieber Nourse met Murray the Moray up close and personal. Now that she’s back home in the Great White North, Sue presents Murray for everyone to know and to love. You are currently browsing the Turtle Journal blog archives for February, 2010.